Hello.....time just flies doesn't it? Mother's Day is not very far off. I have a card to share with Mom in mind today. 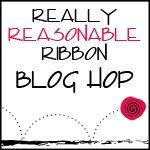 Created for the RRR blog. Really Reasonable Ribbon has some beautiful new blooms as you can see. I love the pale blues/aquas in this collection. Had to create something with them today! I added a lady silhouette and a spool diecut wrapped with a bit of vintage laces. I framed my silhouette with a diecut needlepoint frame for fun. Sewing pocket for Mom Canvas Corp style. I used many of the Heirloom collection papers in my project. I used the tags handmade , which were perfect to tie my theme in. I added in vintage sewing goodies as well for an authentic sewing theme. Look at that gorgoeus bloom......they are one of my favorite goodies. I layered it with a Petaloo bloom and antique rhinestone button. This is the card that fits inside. I created the pocket to fit a card along with candy, small gift, or gift card. Here is the card that sits inside using vintage goodies along with fab canvas Corp.
Hellllllllllo and happy weekend! I have a card to share today made for Really Reasonable Ribbon. Mother's Day is coming up. I have been thinking a lot about my Mom. It is very bittersweet to create something knowing that she will not be here this year. It is also very healing...creating always is for me. Howdy.....popping in quick to share our new challenge over at RRR. This time around it is a "thing with wings" challenge. I am allllll over that! I have been in a butterfly mood....saw one the other day while out walking. When I see one I get all happy...they are like little magical creatures to me. I decided to crumple up a couple of tickets and get them all grungy and insert in the middle. My butterflies create a loose form wreath.....with berries, buttons , and the tags tucked in here and there. Hello there RRR peeps! Today is a fantastic blop hopping day. We are showcasing the new monthly ribbon club ribbons. You should have found your way here from Leslie's blog. So glad to have you here! With out a shadow of a doubt I can honestly say these are my ultimate favorites. Just look at that gorgeousness. These are the colors of my craft room...and of course I love me some Cherries! Such a retro feel....which just makes this girl happy! I knew I wanted to come up with something old fashion and nostalgic. I came up with a rooster card and a matching tag. Very farmhouse style! I wanted that gorgeous red and turquoise diamond to pop out at the bottom so I embossed the bottom half of my card with polka dots and kept it simple. I stamped a sentiment onto pattern paper and fussy cut it out for the bottom. I love the contrast of the blue gingham with the pop of red....made the sweetest bow! I think it really made that rooster image from Craft Secrets come alive too!!! I added a few touches..stickers, vintage button, and mini memo clips and was done, but.....the card just wasn't enough. I decided to use up some paper snippets and make a tag as well. I added some fun elements to it along with some Cherry Twine. Well that is it for me.....your next stop is back at the RRR blog. Have fun folks! Hi guys...back again with another fun Petaloo project! What is more Spring like than hearing the birds tweetering again? This time of year we start hanging out the suet for them. Love to hear and watch them. That inspired me to create a little dimensional birdie of my own! I started with a wooden bird base and covered her...(it is a her for sure) in blue ticking paper by tracing the image onto the paper. I adhered the paper to both sides...she has to have a pretty backside. I than sanded and distressed the edges and added a bit of aging with ink. From there I added some metal border that I aged and snippets of paper crepe. Miss birdie started to take on a fun whimsical look. Ribbons were added along with textured blooms in Ivory and velvet hydrangeas. She was topped off with a mini bird nest and tea stained tag spelling out nest. This is a double posting day.....one for RRR and one for Petaloo...so make sure to scroll up and down for both!!!! Hello there! So happy to be guesting for Petaloo again. Are you enjoying your Spring? It has actually stopped snowing here and the sun is shining. I have a little project to share that really says "Spring Time" to me. I started with a little white berry basket. Great little base for so many things. I added handmade paper crepe to the base and top for dimension. I sprayed it with a colored mist to give it some subtle coloring. Ribbons were added along with some amazing flowers from Petaloo and chipboard embellishments from Graphic 45. Now that little basket would be nothing special with out a little something to put inside. Right? I had to create a little mini card to match along with some sweet little glassine bags. I love the pairing of the textured element blooms with the velvet hydrangeas. Heyyyyyy Youuus! Popping in late this evening to share a project we were asked to make over at Canvas Corp. They sent us out 4 x 4 canvases to alter. We were to create something that shared a bit of ourselves and our art. I think mine does just that! I started with grabbing my favorite items....an old vintage milk cap, Red and Ivory ticking paper, red seam binding mixed with ginghams, old rhinestone button, and metal embossed border that I aged myself. All things I adore! but my favorite of all??? These vintage ceramic cherries...with the most perfect kitschiness. I finally found a home for them. These things all symbolize my love for the old and aged...things with history. My art always has a touch of that. I love layers and dimensions....things that make you take a second look. Of course the cherries are loved because they reflect my name. Here is it all done and sitting on a little easel. It just makes me smile....it is so me!!! Hello to you! Oh....and happy April's fools day! :) There is a great new challenge up over at the RRR blog. It is a flower challenge this time...so break out those blooms! My project has a sewing theme...which is one of my favorites to play with. It is a card for Mom....perfect for a birthday or for Mother's Day. I used a whole bouquet of flowers ..I wanted it to look like a mini corsage. I nestled it inside a vintage gold frame and added my lace seam binding along with 1.5 light blue crochet lace. It needed a cute border towards the bottom so I added buttons and mini spools wrapped in natural burlap string.